Large - $72.99 Only 3 left! Your little girl has always been great at keeping track of her brothers and sisters at home. She knows when people brush their teeth, and when they don't. She knows when they eat their vegetables, and when they try to sneak them to the dog. And she always knows WHO STARTED IT. Sounds like your little girl is perfect to join the junior police squad. We're always looking for kids who can protect and serve their families one child at a time. Now, much like the real police force, we have a rigorous training session before anyone can join. First step: do you own a pair of aviator shades? Second step: can you GET a pair of aviator shades? 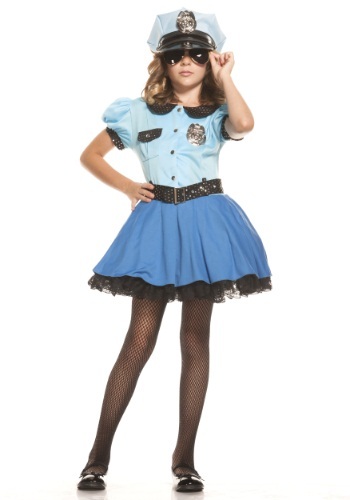 Third step: check out this Girls Police Uniform Costume to be absolutely sure you look the part before you act the part. Because what good is all that authoritarian goodness when you don't have the uniform to back it up? No good, that's what. And this 100% polyester costume has all the authority she could ever need before laying down the law. The blue dress has mesh netting in the sleeves for a puffy appearance. It has black trim with silver sparkles on the collar, pocket flaps, and sleeve cuffs. It snaps at center front and the belt clips around the waist. The dark blue skirt has an attached black lace underskirt, and the police hat has an attached silver badge. Aviators sold separately (on another page on our sight).